The problem with art criticism is that it's a limited genre. It's pretty hard to do something new in art criticism without leaving the genre behind. That's OK for most of us because we have no intention for our criticism to go beyond its primary function--to say something about some art--and it s secondary function--to keep a reader engaged for a brief time. Going beyond that risks turning a functional piece of writing into something else. Literature, maybe. 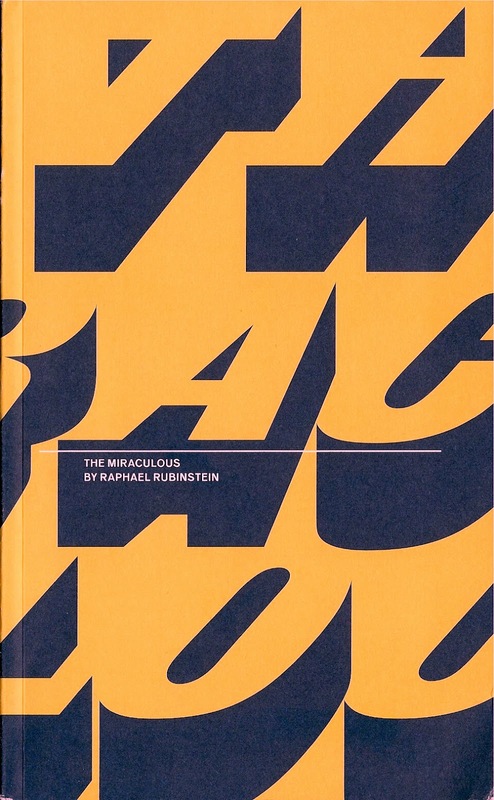 That's the risk art critic Raphael Rubinstein takes with his new short book The Miraculous. The Miraculous consists of 50 chapters, mostly pretty short, describing the way an artist has come up with a particular artwork--usually a conceptual artwork or a performance. Depending how familiar you are with the world of performance art and conceptual art, you will recognize some of these. And as I read, I noticed that chapter 22 described the bizarre time-passing activity of Percival Bartlebooth, the character from Georges Perec's novel, Life: A User's Manual. That made me smile, because when I read that novel so very long ago, I thought that the fictional Bartlebooth's absurd life-long project was basically an insane work of art. And it was enough that Perec described its execution--it didn't have to actually be done to be real. And that could apply to any number of the pieces or actions described in this book. The fact that they were actually executed is, well, miraculous. In 1979, an artist decides to shake hands with every employee of the New York City Sanitation Department. It takes her eleven months and two days to shake the hands of all 8,500 workers. You may recognize this as a piece of art done by Mierle Laderman Ukeles, who has been the artist-in-residence at Department of Sanitation since 1977. There is an index in the back that will help you identify the artists because the chapters never mention them by name. The descriptions are fairly deadpan, but because what they are describing is often so strange, they achieve a kind of poetry. By not naming the artist. Rubenstein forces the reader to think about the work described. No written work is completely neutral, but Rubenstein appears to be going for a journalistic "degree zero" style. No overt opinion is offered by the author, but sometimes his enthusiasm leaks through. Two of the "fictional" works (works created within literary works) are by members of OuLiPo, a French literary group that was famous for writing prose and poems governed by various constraints. That's what Rubenstein seems to have done here--describe the work, it's creation and execution, but never name the artist, never analyze the work, never contextualize it within the world of art. The constraints he has placed on himself in writing this brief book results in a work that describes a universe of conceptual art in a way that no art historical text could achieve. And it does so with unexpected beauty.